There are few things in life that go better together than popcorn and wine. In honour of two of our favourite things, we’ve compiled a list of our best popcorn and wine combos. These easy pairings take just a few minutes and are sure to add a little bit of fun to your next movie night. From sweet and savoury to cheesy and bubbly, we have a pairing for just about every palette. As the weather begins to cool down and the days inevitably get shorter, it's time to accept that another season is finally upon us. No, we're not talking about fall (there's still a little bit of time left before pumpkins become a doorstep staple), but the back-to-school season. Of course there's lots of new things to look forward to - books, teachers, subjects - but we bet many of you would rather be on a sunny beach than in a classroom. 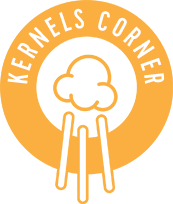 So, to help make the process a little sweeter, we've brainstormed four great ways you can incorporate Kernels Popcorn into your back-to-school routine. For many, long summer nights are the perfect time to curl up with a good movie. Since few things in life go together better than movies and popcorn, we’ve decided to take this classic combo up a notch. We’ve handpicked some of the best movies to watch this summer and we’re pairing each film with complimentary popcorn to go with it.